The Alaska Department of Fish and Game is asking anglers to not only send any information about how a bass found its way into Alaskan waters but to also remove any bass they catch from said waterways. It would be curious to know if this fish would be the state record bass in Alaska or if it is the first ever caught in the state. For sure it's the first they have heard of one being caught in Sand Lake. It's likely ADF&G doesn't track records for "invasive" species but it would be interesting if more anglers tried to catch the bass out of the waterways if they thought they might get a state record. The Alaska Department of Fish and Game (ADF&G), Division of Sport Fish announced that a local angler caught a juvenile bass on Sand Lake in Anchorage on Monday evening. 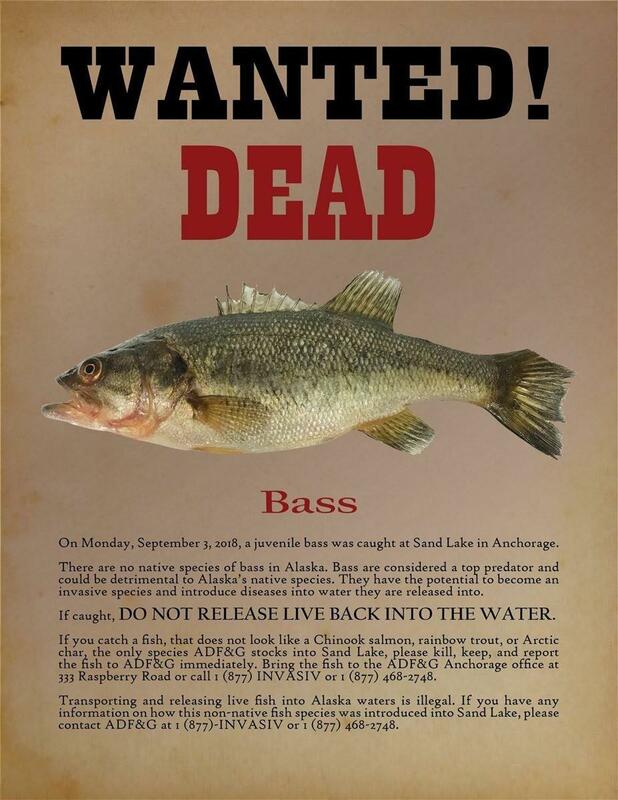 Bass are not native to Alaska, and it is illegal to transport live fish anywhere in the state. It is not known if this is an isolated incident, or if there are more bass in the lake. Biologists are quickly mobilizing to determine if other bass can be found by using gill nets and rod and reel methods. Early detection of potential non-native species is key if eradication efforts may be necessary. “This is the first time we’ve learned of bass in Sand Lake,” stated Fishery Biologist Kristine Dunker. “Our primary concern at this time is to determine if there are others, and more importantly, if there is evidence of a reproducing population. Over the next several days ADF&G staff will be concentrating their efforts on Sand Lake to evaluate if other bass are present, and if additional efforts will be needed to remove them." ADF&G is urging anyone who fishes in Sand Lake to be aware, and closely monitor the fish they catch. If they catch a fish that does not look like a salmon, rainbow trout, or Arctic char which are the only species ADF&G stocks into Sand Lake, please kill, keep the fish, and report it immediately to ADF&G. Do not release it back in to the water live. Bring all suspected non-native species in to the Anchorage ADF&G office at 333 Raspberry Road or call (877) INVASIV or (877) 468-2748. “If anyone has any information about how bass were introduced into Sand Lake, please contact ADF&G at 1-(877) INVASIV or 1-(877) 468-2748,” stated Dunker. Here is a copy of the flyer they posted. You can follow their thread on their Facebook Post.